I was looking for something meaningful to do for my birthday and searched for ‘local wolf sanctuaries’ to visit. I contacted Wolf Connection for their semi-private hike that Easter Sunday and I immediately signed up, and so as they say…the rest is history! I was completely enamored with the beautiful people that run the organization as much as I was with the wolves. Once I came to Wolf Connection® and met the 4-legged and 2-legged creatures, I never left! I became a volunteer about a month later and haven’t looked back. I’m now a Wolf Connection® Assistant! It’s the most magnificent and rewarding thing I’ve ever been a part of. 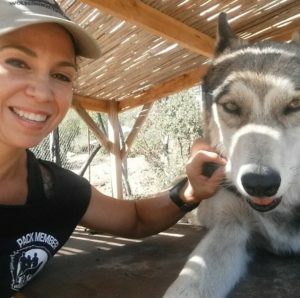 I’m so proud and honored to be a Pack Member where I continue to learn and grow and nurture relationships with all the people and the incredible animals on the compound. 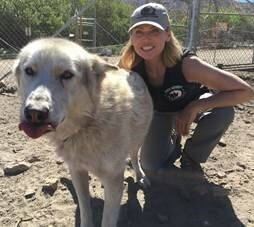 My animal rescue work in Los Angeles, spanning over 15 years, included meeting a dear soul (and rescued wolfdog) named Arrow. After personally knowing a wolfdog and learning about the fate of most wolfdogs in the United States, I was led to the gates of Wolf Connection. Each wolfdog has so much to teach our guests and our volunteers. There is a sacred space that only animals (especially the wolf) can find within humans. I am honored to experience and witness this life changing exchange. When not at Wolf Connection®, I spend my time working with organizations around the globe, helping them to reach their goals through their most valuable asset- their people. I am thrilled that I get to take the lessons of our pack into the corporate world! While working as a receptionist for a veterinary ophthalmologist, Wolf Connection® brought one of the animals in to see the doctor for a scratch he had gotten on his eye. Living up to his nature, Malo attempted to escape from the exam room as I entered and ended up in my lap. He seemed very curious about me and I was interested in him! While the doctor was doing the exam, I asked one of the staff members to tell me about the organization. 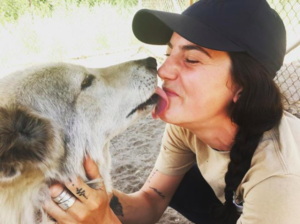 By the time I had heard about the wolf dog rescues and the programs Wolf Connection® offers to people, I had my hands over my face and was crying. I knew I had to be involved. So I emailed the volunteer coordinator that evening and within a couple weeks, I had gone on my first community hike, and applied to volunteer. Being a part of Wolf Connection® has brought me an immense amount of awareness about myself and the world. Fusing wolf dog and human rehabilitation is the cherry on top of my already sweet life. I first heard of Wolf Connection® after being invited by a friend to a community hike. She knew there was only one thing I love as much as I loved working with children and that was animals. Before the hike, I did my research and learned about Wolf Connection’s® mission. I became even more excited about going to this incredible place and meeting the incredible animals that helped so many youth. Wolf Connection® way exceeded my expectations and it was on my first tour that I found my first wolf dog love in Max. His eyes, his playful spirit, his beautiful howl – what’s not to love? I raised money to sponsor him and got the opportunity to meet him face to face which was simply incredible. I went on another community hike before deciding it was time for me to start volunteering. Volunteering has been such a tremendous learning experience and I am forever grateful that I decided to go on that first community hike and open myself up to the whole experience. The wolf-human bond is truly powerful and healing. I feel honored to get to be a part of this remarkable organization. 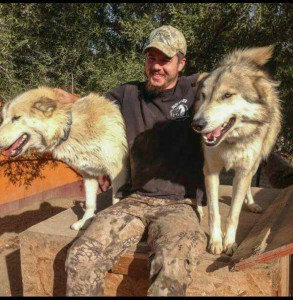 After years of working with a wolf-protection group while living in Minnesota (where wolf hunting is legal), I moved to Southern California. I searched for some way to help wolves here, and came across Wolf Connection®. I went to an informational session and felt my heart belonged there. I’ve been volunteering and working there ever since! As I am an artist and art teacher, it is deeply touching to be able to help children and wolves in one place – while seeing them so closely connected. 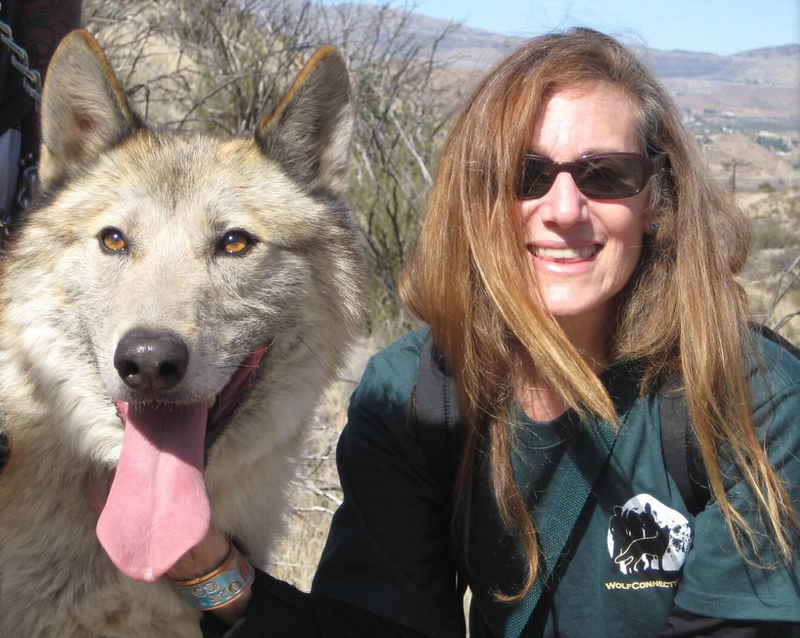 Wolf Connection® has been pivotal in my personal growth, as well – due to both the human and canine animals there. It’s a place like no other – and no matter what you’re looking for – I bet you could find your way to it there. As a child, Anita had always made a connection with animals. Growing up summering on her grandparents farm, she would go out amongst the chickens, cows, pigs and a variety of animals native to South Dakota. The wolves and bison of the Black Hills seemed to call to her and, throughout her life, working with animals became her passion. 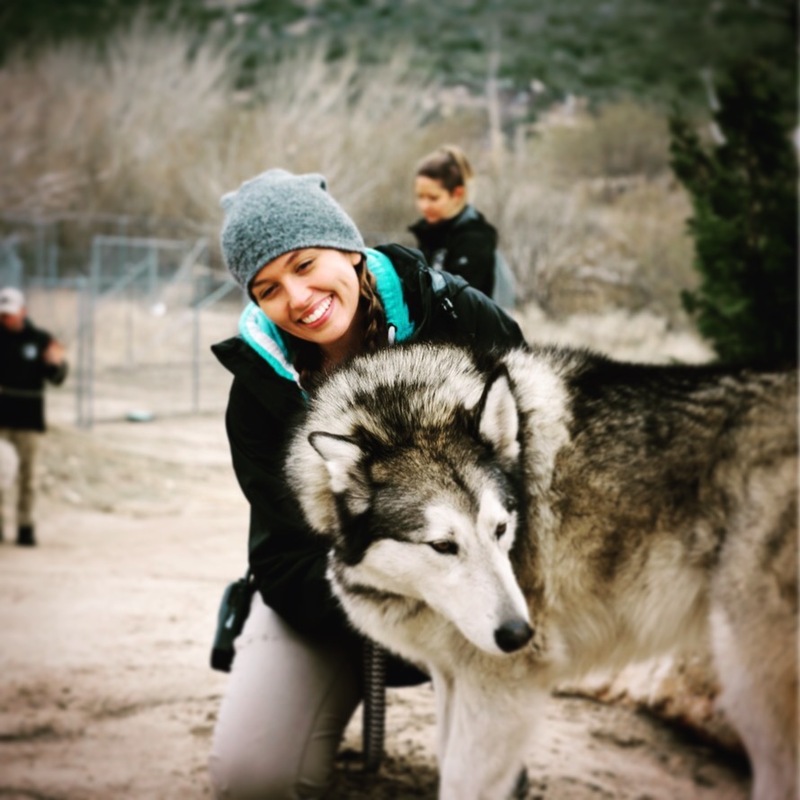 She graduated from the Exotic Animal Training and Management program at Moorpark College in 2005, and from there has worked with a wide variety of exotic animals. She brings her knowledge and passion to Wolf Connection where she is helping to expand the positive experiences of the wolves and guests, allowing the healing of both the mind and spirit. 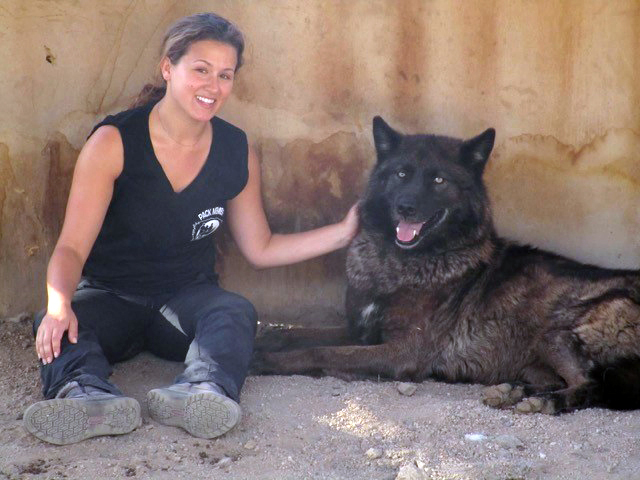 Natasha has always had a profound connection with animals and finding Wolf Connection® helped in developing her love for wolves. Building relationships with the pack (human and four-legged) has become one of the highlights of her life. My husband Dave and I have been wolf advocates in Alaska for years so when we arrived in Acton and heard the distant howling of a wolf-pack we knew we had to find them. After searching, we found Wolf Connection® and have been there ever since. After receiving an intriguing email from Wolf Creek Restaurant to come meet and take photos with some wolves I just had to go. I met Teo with his “Wolf Truck” and then met Maya, Rocky and Zimba: three stunning wolf dogs who changed my life forever. I began going on the monthly community hikes and eventually became a volunteer a few years ago. I am so honored to be a part of Wolf Connection®. It is a place where you can hear wolves howl, hear a Raven’s wings brush the air, and listen to the wind through the trees. It is a place where you learn many things and meet people from all walks of life. You can hike by a stream, discover your wild spirit or watch the wolves just be. It is a place of challenges and of healing. I love this place. I had been looking at rescues and shelters to volunteer with, but none of them seemed to be right. In the summer of 2010, a news story came on about a fire that had broken out and mentioned that the wolves were okay. 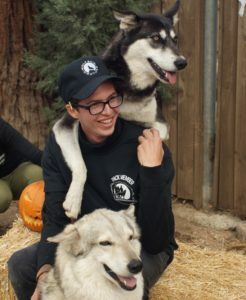 Since I had been a wolf lover for years, I immediately went to the Wolf Connection® website to check them out and found they had a volunteer program. I went to the next training and knew this was the right place to be. Taking care of the pack in their forever home makes me happy. 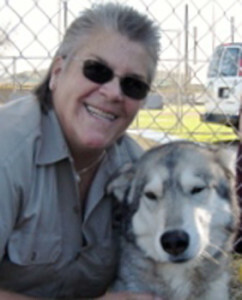 Ana has been with Wolf Connection® since 2011. She came as a guest to a community hike and never left. Falling in love with wolves was a big surprise as she only ever had small dogs. But these wolves captured her heart and didn’t let go. The love of the wolves who have left, the wolves we have now, and the anticipation of the wolves to come keep her coming back. I have been an animal lover since day one and have always been itching to volunteer somewhere that I could interact with and help animals. Growing up, I would study various dog breed books and watch Balto on repeat. It wasn’t until I was in college, however, that I heard about Wolf Connection® and attended their spooky Halloween community hike. As we were telling scary stories among a campfire, the wolves joined together in a powerful howl. I was hooked, to say the least. The Wolf Connection® mission spoke to me as an organization built on the mutualistic relationship between wolf and human. Once I met more members of the pack, animal and human, I knew I was home. The way I stumbled upon Wolf Connection® was timed so perfectly it had to be some sort of kismet. 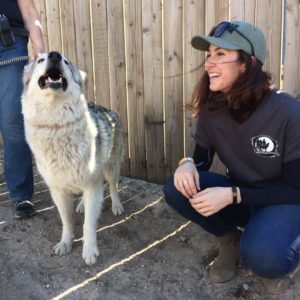 Having recently decided upon a career as a veterinarian and embarking on my educational journey, a friend asked if I would like to accompany her to a wolf/wolfdog rescue. After visiting the compound, I felt like I had just been “home”. It wasn’t a place or home I had been to before; nevertheless, the scenery, wolves and people all had the markings and feeling of it. 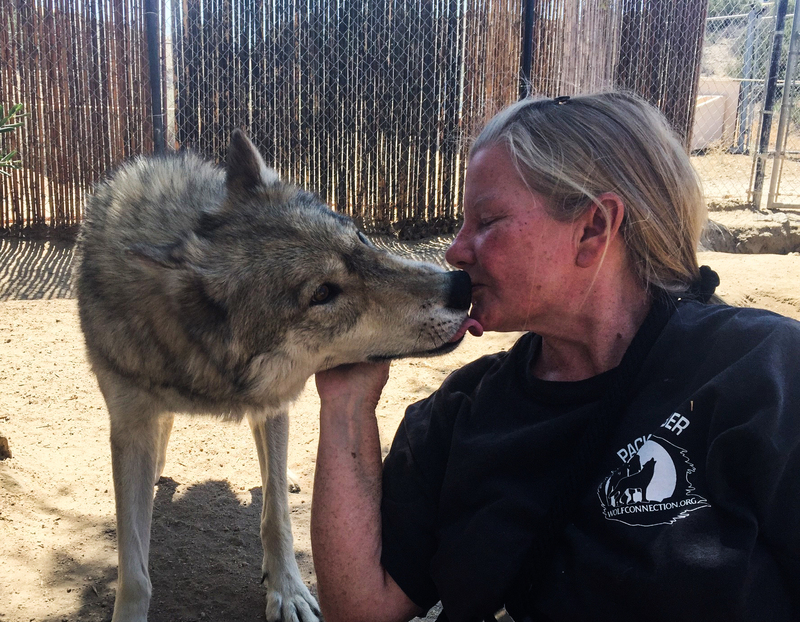 The experiences I have had at Wolf Connection® are unparalleled to anything in my life before, including meeting my best friend Neo (wolfdog) at the ranch! I have grown in areas I had previously believed were lifeless, I have watched others grow (both two, three and four legged), and I get to serve in something greater than myself. I am grateful every day for my time at Wolf Connection® and I hope that I can continue my own education and to educate people about wolves and wolfdogs wherever I go. 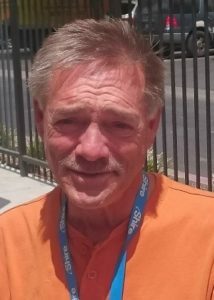 A medically retired Marine. 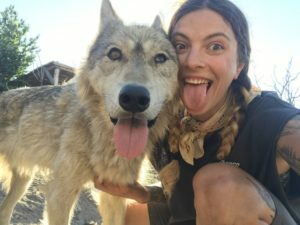 I came to Wolf Connection for my love of animals, especially wolves. 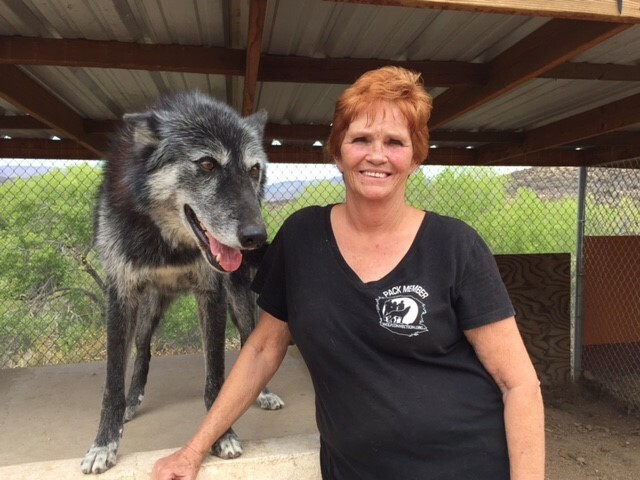 Being at Wolf Connection® gives me the opportunity to help both the animals I work with as well as the clients we serve. 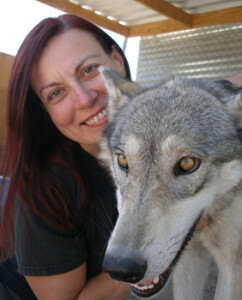 I am also lucky enough to get to help educate people about both wolves and wolf dogs. I have always loved wolves, and animals in general. Since being honorably discharged from the Marine Corps, I have immersed myself in solitary pursuits and have missed working for a greater cause. However, as a full time Physics Major, I felt I had barely enough time for myself, let alone others. One special Halloween hike introduced me to the Wolf Connection®. Something about the place drew me in instantly and I somehow knew I was about to make time to be amongst the wolves and the people who worked with them. Volunteering at the Wolf Connection® fulfills my need to serve, and enriches my life in a very deeply spiritual way. I am so grateful to help these amazing animals in any way I can, and I am so proud of what this organization stands for! I was struggling to cope with the death of my close friend when I heard about Wolf Connection®. I met Teo shortly after and he told me to come visit and “talk to the wolves”. I had no idea the power of these animals. Just being in their presence helped me begin to heal. But Wolf Connection® is not just about the animals — the human pack has also provided me with support, knowledge and wisdom that has changed my life in many ways. I’m currently a grad student studying psychotherapy, and I was beyond impressed with the Wolf Connection’s® dedication to helping youth. Whether you’re pulling weeds in 100 degree heat, hiking with your favorite Wolf, or bonding with the other volunteers, every moment is equally as challenging, fulfilling and joyful as the next and it keeps me coming back for more. I am eternally grateful to every animal and human dedicated to making the Wolf Connection® what it is today. I first heard of Wolf Connection® in the Antelope Valley Press. After reviewing the phenomenal website more than a few times and learning so much from that source in itself, I signed up for the Community Walk in June. I was extremely touched by experiencing the wolfdogs close up and hearing each of their stories and quickly realized I would like to be a part of their lives. After hearing “the group” howl that same day I believe they were telling me they agreed! The overwhelming added bonus in volunteering is becoming a part of such a dynamic, positive, and influential organization. 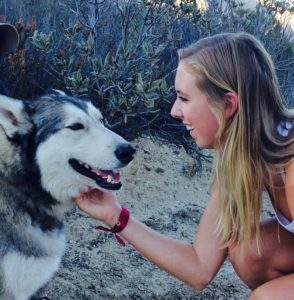 Wolfdogs, youth, adults, and community outreach, nature, the environment … WOW! 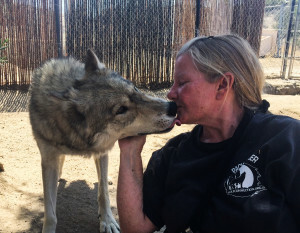 I am amazed at the diversity of what is offered at Wolf Connection® and the warmth, kindness, and caring so apparent. To be part of the “good things in life” gladdens my heart indeed. A past docent at the Los Angeles Zoo I was honored to be in the position to teach about, and in some cases, introduce others to the animal kingdom. I enjoyed my time there and look forward to that feeling and experience again this time for the wolfdogs! I am very appreciative to Wolf Connection® for allowing me the opportunity “to give and to receive” and to learn from the staff, volunteers, and the wonderful wolfdogs!